Once again I find myself in the position of replying to your columnist Shamindra Ferdinando, this time with respect to his 23 March 2016 column ‘A NATO role in failed Norwegian peace bid and costly propaganda projects’. In a column peppered with grandiose, and in several instances unsubstantiated claims, I will confine myself to commenting on those that relate specifically to the role of the Norwegians in Sri Lanka – the subject of my recent book To End A Civil War: Norway’s Peace Engagement in Sri Lanka, on which Ferdinando has been good enough to comment on several occasions in recent weeks. First, Ferdinando asserts that the ‘Norwegians believed decision making process (sic), as well as the public opinion in any conflict-affected country, could be influenced through well-funded propaganda projects.’ This strikes me as a tendentious interpretation of Norwegian strategy in Sri Lanka. As I understand it their view was that, in Sri Lanka as in other post-conflict countries, there was a real need to assist the building up of a critical constituency that both understood and supported the peace process, in particular within the majority Sinhala community. To that end, it was felt that one of the most useful things Norway could do was to support a wide range of civil society initiatives whose objectives were clearly aligned with promoting peace and general, and support for the Ceasefire Agreement (CFA) in particular. To call these ‘propaganda projects’ is simply misleading – unless of course, you are of the view that expressing support for the peace process constitutes propaganda-mongering. Moreover, to construe the fact that the ultimate impact of such Norwegian-funded peace constituency building was limited as evidence that it constituted what Ferdinando calls ‘squandered Norwegian taxpayers’ money’ is similarly misguided. In my view the real lesson learned here is that external support for peace can never be a substitute for locally owned and initiated efforts. What Sri Lanka really needed in the aftermath of the 2002 CFA, in other words, was a concerted government-led effort to explain and advocate the benefits of peace among the population, in particular those sections of it, such as rural Sinhalese communities in the South, most likely to be suspicious of a peace deal with the LTTE. By any account, however, that is precisely what didn’t happen. 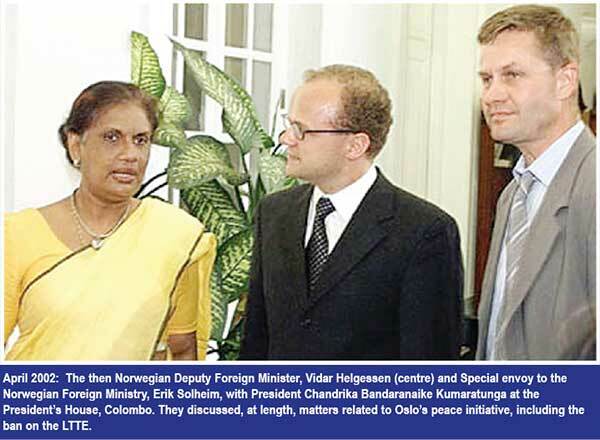 And in this context, former President Chandrika Kumaratunga’s justifiably proud recollection, in the course of a book interview with me, of the dramatic impact on public opinion of the Sudu Nelum (White Lotus) movement initiated in the mid 1990s to persuade the Sinhala population of the overarching imperative of achieving peace with the Tamils is surely an instructive precedent. (Recall that in the space of two years, popular support for peace moves up from only 20 to 70 per cent). Next, referencing the 2012 ‘Pawns of Peace’ evaluation of Norway’s engagement in Sri Lanka, Ferdinando suggests that the ‘ambitious Norwegian peace initiative’ suffered an ‘irreparable setback’ due to its ‘inaccurate assessment of the ground situation’. Specifically, he suggests ‘Norway operated on the premise that the Sri Lankan government lacked the wherewithal to defeat the LTTE militarily’. This claim has the distinction of being both inaccurate and trivial. Inaccurate, because at no point was the fundamental rationale for Norwegian support to the Sri Lankan peace process premised on calculations of military balance and advantage (although it certainly took account of such matters). Oslo supported peace because it – like many others – believed that it was a better alternative to continued conflict between government forces and the LTTE. Next the 2002 CFA was not, as Ferdinando states, a ‘Norwegian peace initiative’. In fact the real initiative for the CFA came squarely from the parties, notably from Ranil Wickremesinghe following his electoral victory in December 2001 and from the LTTE, who in the aftermath of their devastating July 2001 attack on Katunayake airport and from what was by then a position of undoubted strength adopted a notably positive approach to peace efforts. As befits a facilitator, Norway’s role was to assist in the final agreement’s formulation, shuttling between the two sides in an effort to achieve consensus on formulations and so on. It is thus essential to underscore that both the CFA and the broader peace process were in the first instance a bilateral initiative of the Sri Lankan government and LTTE, supported and facilitated by the Norwegians. Accordingly, responsibility for the process’ direction, setbacks along the way and ultimately breakdown rests squarely with the parties, and nowhere else. Thus Ferdinando’s suggestion that there was a ‘Norwegian project in Sri Lanka’ is ultimately false. Rather, for a time, there was a peace project in Sri Lanka – initiated with the Ceasefire Agreement – to which Norway lent its whole-hearted support. Next, in the context of a discussion of what Ferdinando describes as the UNP govern-ment’s CFA-era ‘suppression’ of themedia in a ‘bid to prevent … reportage of the actual ground situation’, he alleges that the Norwegians ‘failed to take tangible measures to discourage the LTTE from causing trouble’ – presumably meaning with the media. Sadly, the comment suggests a failure to understand what being a third party peace facilitator does, and does not, involve. In Sri Lanka neither the Norwegians as facilitators nor the Sri Lanka Monitoring Mission (SLMM) as monitors had the mandate – or indeed the practical instruments – to take the kind of ‘tangible measures’ Ferdinando presumably has in mind. Such an interventionist mandate and capability was held exclusively by the parties themselves. Further on, Ferdinando states that the ‘much touted assertion’ that ‘NATO member Norway is a lightweight facilitator’ simply ‘does not hold water’. First, it is worth recalling that the term ‘lightweight facilitator’ was first used by none other than Lakshman Kadirgamar – ‘lightweight’ being precisely Norway’s preferred quality in the eyes of the former Sri Lankan Foreign Minister. With respect to the (correct) reference to Norway as a NATO member, Ferdinando takes an ‘expert on Norwegian initiative’ – a thinly-veiled reference to myself, as the context makes clear – to task for questioning his claim that, in as yet unspecified ways, Norway “involv[ed] NATO in their project here.” By way of supporting evidence, Ferdinando’s latest column points to the Pawns of Peace Evaluation – well, actually, a single page in it – which he also suggests I ‘obviously hadn’t perused’. [In fact I have, as a simple glance at the bibliography of my book plus a number of references and quotes from the Evaluation would have made clear to him). Here it is then, the one reference to NATO (p.100) – a search of the whole Evaluation turned up three more, all of them hidden away in minor references. Summarizing this single substantive reference to a NATO connection or involvement in Sri Lanka, Ferdinando concludes from it that ‘as the five-nation Nordic Sri Lanka Monitoring Mission (SLMM) had received intelligence from NATO, it didn’t require intelligence provided by India’s Research and Analysis Wing (RAW) (page 100)’. Is this what the Evaluation in fact says? The answer is provided in actual quotation of which Ferdinando himself provides a part. Does this offer proof that since the SLMM received intelligence from NATO, they didn’t require input from India’s RAW? No, I think, not even on the most fanciful interpretation. And as if this weren’t bad enough, Ferdinando goes on to conclude with the rhetorical flourish that ‘NATO intelligence would have had a significant impact on the (sic) decision making process’ – although it’s not clear which such process, when or even how this claim has in mind. Last but not least, the pièce de resistance: an article title that reads ‘A NATO role in failed Norwegian peace bid and costly propaganda projects’. In other words a lone, dubiously-interpreted reference as the basis for a headline! Whatever else, I believe the Norwegian engagement in Sri Lanka deserves more careful consideration and analysis than is on offer in Ferdinando’s latest article.